“The North part of Bucharest is very beautiful,” our young driver tells us proudly, and it surely is. Spacious parks and rows of roses in full bloom line the streets. The architecture slides seamlessly from the very modern to buildings which were built in Byzantine times. The architecture is varied and fascinating. And… surely, that isn’t the Arc de Triomphe? This is the first of two days in Bucharest, Romania, and we are bound for a river cruise which—if flooding rivers do not prevent – a will take us to Budapest by way of the Danube. Although there are rumors that rivers have flooded,, Bucharest seems untroubled by such things. For a miracle, all our flights have been on time even though we hopped from plane to planes from RDU to Atlanta to Charles DeGaule and then to Bucharest. More incredible, our luggage has followed us! Still, we were sleepless and somewhat dazed when we stumble out onto the concourse and see.. the sun. Yes! Despite dire predictions, rain is not pouring down on us and the weather is balmy. As we start our walk, thunder booms. Luckily, Romanian showers spend themselves in an hour, and we spent a delightful hour walking, admiring Revolution Square and the architecture and eating authentic Romanian fare. We had hoped for Transylvania goulash—Bucharest was apparently the summer of the dreaded Dracula — but the goulash has sold out, and we have to be content with seeing the bats swoop low over the city as we stroll back to the hotel. This morning we are taken to Revolution Square, where we walked yesterday, and then on a tour of the city which includes the Village Museum, an open air museum made up of houses that were taken down from villages around Romania and then reassembled here. There is a church that is made entirely out of wood, one of the oldest of its kind. There are houses built low to the ground—most of it being underground—and thatched with straw because the Turkish soldiers were wont to destroy villages in the farming areas of the country and often did not spot these low-build houses. Eventually, after seeing many more sites and eating lunch, we are conducted to our ship. Rain has started again and wind battles us for umbrellas as we hurry on board. This is our first glimpse of the Danube which, contrary to Mr. Strauss’ waltz is NOT blue but more like green and often ochre perhaps because of all the flooding that has been going on. While other long ship cruises have been cancelled because of this flood, ours—named for a Scandinavian sea god– is yet outward bound. I’m glad you enjoyed your stay in Bucharest. I hope the flooding of the rivers does not cause you any trouble in getting to your other destinations. May your travels be safe. Thank you, dear Joan! The river levels are rising… the ship is hoping to slide under a bridge 60 kilometers away this afternoon…. we will see! 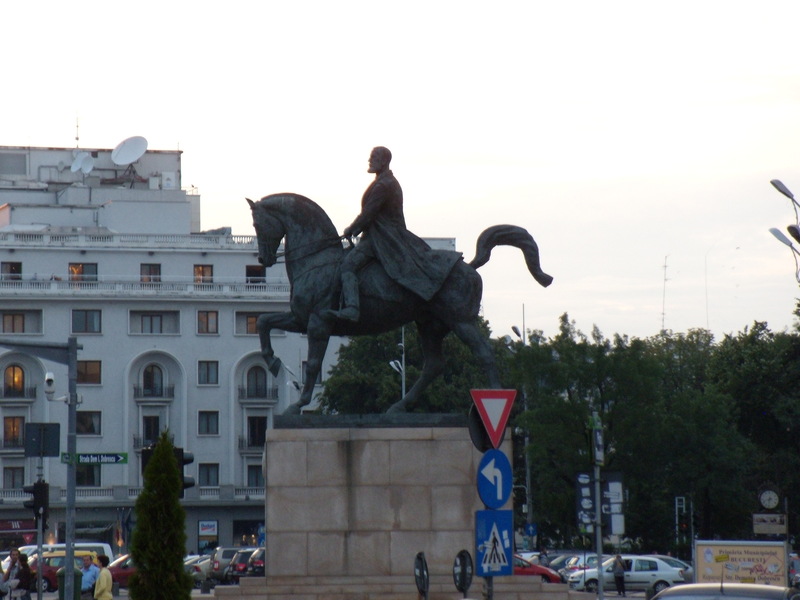 So far, though, a fascinating trip… we are in Serbia today,. Glad you are having such an enjoyable time. Can’t wait to hear of your experiences when you get home. Hooray for another great adventure! I hope the weather cooperates for your trip on the Danube. You’ll find a way to enjoy it, even if it’s while holding an umbrella. Enjoyed this blog. My daughter is in Budapest–says she loves the city!